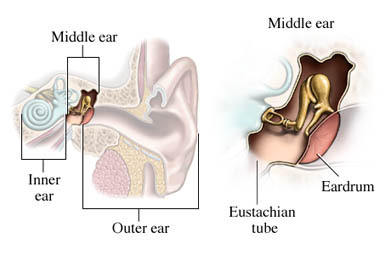 A tympanomastoidectomy is a surgery to repair the middle ear. It includes repair of the eardrum and removal of a damaged mastoid bone. The mastoid bone is the part of your skull that you can feel behind your ear. Recurrent middle ear infections , tumors, or excess tissue growth can cause damage to the eardrum and surrounding tissue. A tympanomastoidectomy is done to repair the damage and, if necessary, remove damaged tissue. You may meet with your doctor for a physical exam, medical history, and tests before the surgery. A doctor will use an otoscope to examine your ear. An incision will be made behind your ear. Any growths inside the mastoid will be removed. Infected bone tissue will also be removed. If a large part of the bone is removed, synthetic material may used to replace it. The eardrum will be removed. Any excess fluid will be drained out of the middle ear space. Holes of the eardrum can be repaired by placing new tissue over the hole in the eardrum. Excess scar tissue in the area will be removed. If necessary, the bones of the inner ear can be replaced with synthetic material. This helps improve or restore hearing. Tubes may be left in place to help fluids drain from the ear. When all of the procedures are complete, the incision site will be closed. Sneeze with your mouth open and lightly blow your nose. Keep water out of your ear. Avoid showers and washing hair until it is approved by the doctor. Avoid swimming until doctor says it is okay to do so. Then limit swimming for several weeks. Avoid flying until your doctor says it is okay. Cholesteatoma. EBSCO DynaMed Plus website. Available at: http://www.dynamed.com/topics/dmp~AN~T115151/Cholesteatoma . Updated June 27, 2013. Accessed December 22, 2017. Mastoidectomy and cholesteatoma. Society for Middle Ear Disease website. Available at: http://societyformiddleeardisease.org/SurgicalAtlasofPediatricOtolaryngology/5-Mastoidectomy-and-Cholesteatoma.pdf. Accessed December 22, 2017. Tympanomastoidectomy. Midwest ENT website. Available at: http://mwent.org/surgical-info/tympanomastoidectomy.html. Accessed December 22, 2017. Tympanomastoidectomy. Paparella Ear Head & Neck Institute, P.A. website. Available at: https://www.pehni.com/patient%5Fed/tympanomastoidectomy.htm. Accessed December 22, 2017. Tympanoplasty with ossicular chain reconstruction—surgical instructions. Head & Neck Associates of Orange County website. Available at: http://www.hnaoc.com/docs/tympanomastoidctmy-w-ocr-june-2015.pdf. Updated September 2013. Accessed December 22, 2017.